ERBIL, Kurdistan Region—The Kurdish Peoples Protection Units (YPG) will lose American support if they do not retreat to east of the Euphrates. Yildirim, speaking at the same press conference, said that Turkey will not allow Kurdish advancements along its border. The United States had promised Ankara that Kurdish forces participating in the operation to retake the northern Syrian city of Manbij from Islamic State would not remain in the liberated areas. Ankara, which is vehemently opposed to Kurds expanding their territory in northern Syria, along Turkey’s southern border, gave tacit consent to the Manbij operation following the American’s promise. The YPG-led Syrian Democratic Forces (SDF) declared victory in Manbij on August 12. Within days, the SDF formed a military council for the liberation of al-Bab, 50 kilometres southwest of Manbij. Kurdish forces have made no secret that their ultimate goal is to link up their western canton of Afrin with their eastern cantons of Kobane and Cizre in their self-administered region Rojava. On Wednesday morning, Turkey launched Operation Euphrates Shield to liberate Jarablus, on the west bank of the Euphrates, from ISIS in a “short and results-based operation,” according to Deputy Prime Minister Numan Kurtulmus. The goal of Turkey’s offensive in Jarablus is to cleanse the border of “all terrorist elements, including Daesh and YPG,” tweeted Presidential spokesperson Ibrahim Kalin on Wednesday. Turkey is backing the Free Syrian Army (FSA) in the offensive and supporting it with both ground and air support. 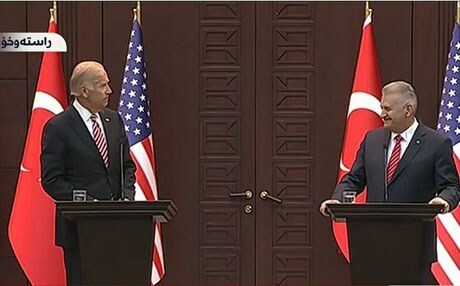 By Wednesday afternoon, as Biden and Yildirim held their press conference, the FSA had reached the centre of Jarablus, according to Turkey’s state-run Anadolu Agency. Earlier in the day, the FSA captured four villages: Keklice, Kivircik, Elvaniye, and Guguncuk, stated Dogan News Agency. ISIS militants have withdrawn from several villages in areas around Jarablus and have retreated south, Reuters reported, citing a Syrian rebel commander. Turkish F-16s joined by international coalition jets hit ISIS vehicles coming from the al-Bab area to provide backup for militants in Jarablus while Turkish tanks blocked ISIS supply routes in Syrian territory, Hurriyet Daily News reported. Damascus condemned the Turkish incursion on its territory, calling it a breach of sovereignty and accused Ankara of “replacing one type of terrorism with another,” Syria’s state media SANA reported, citing an official source within the Foreign and Expatriates Ministry. The leader of the YPG’s political wing, the Democratic Union Party (PYD), Salih Muslim, warned that Turkey will be defeated in Syria along with the Islamic State, shortly after Ankara began its operation against ISIS in the border town of Jarablus. “Turkey is in Syrian Quagmire. will be defeated as Daish (ISIS),” Muslim tweeted.